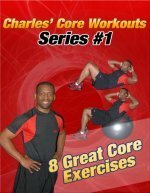 Here is a simple home workout with 3 easy stomach exercises. Your workout doesn't have to be crazy to be effective. There is a lot of value in consistently doing the basic exercises. The advantages of working out at home are that you don't have to compete with others for space (like in a gym) and you save time by not having to dress up and drive to the gym. You can do this stomach workout in less than 10 minutes. You can even do it while you're watching your favorite television show. You can click on the pictures to read more about the exercises. Perform them in as a circuit workout. This simple means that you will do all three in a row without resting until you finish the third exercise. Rest for 0-10 seconds and then move on to the second exercise. The second stomach exercise is reverse crunches. Rest 0-10 seconds and then move on to the third exercise. The third exercise in the circuit is bicycle crunches. Perform 20-50 repetitions (10-25 on each side). Rest for 1-2 minutes before starting at the beginning. Do the circuit 2-3 times and you're done with this workout. This is a simple workout, but it can strengthen your stomach muscles while you're at home. Aim to exercise your stomach 2-3 times a week. If you're not in the mood to go to the gym, just lay down a mat or lay on the carpet and start crunching.